Dylan Scott vowed never to return to the dreary town of Dawson’s Clough. But one visit from a beautiful ex-lover and he’s back in Lancashire, investigating a possible murder. The police think Prue Murphy died during a burglary gone wrong, but her sister isn’t so sure—and neither is Dylan. After all, the killer overlooked the only valuable thing in Prue’s flat. Ex-police office Dylan Scott is an amazing detective with a proven track record. Unfortunately, there isn’t a high demand for solving mysterious deaths. That is until Dylan’s old flame, Madeleine “Maddie” Murphy comes tumbling into his office looking for help with the investigation into her sister Prue’s murder. Back in Dawson’s Clough, Dylan sifts through the clues, meeting the main players, including Prue’s shady landlord, the owner of a not-very-successful wine bar, and the widow of a renowned artist, who may or may not have been friends with Prue. And as always, Dylan must juggle solving the crime with his family life, and this time, an ex-lover who wants to win Dylan back into her bed. Oh, I LOVE the Dylan Scott Mysteries! There is just something about the almost anti-hero that has me cheering for him all the way. Dylan is a good man, and we’ve seen this time and time again, over the course of five stories. His life is far from perfect, but he makes the most of it. He loves his wife and kids and works hard. I’ve said this before, but one of my favorite things about the Dylan Scott books is that we view the crime scene and plot development from multiple points of view. One would think that this would “give away” the murderer, but it actually has the opposite effect. The reader is left wondering “whodunit,” because everyone either seems to be hiding something, or totally innocent. The multiple POVs are never confusing and help move the story forward in such an interesting and exciting manner. This time around, the case appears fairly straight forward. Prue was killed in her home, and not by a burglar as the police believe. As Dylan uncovers the facts, he discovers that Prue is in possession of a very valuable piece of art, painted by a recently deceased, extremely famous artist. He figures that someone may have wanted to steal the art for profit, but it would have to be someone that knew Prue had the painting. Part of the mystery is figuring out how Prue came to possess something so valuable. I was captivated by the unfolding plot and desperate to solve the crime myself (which I did, but not until almost the end!). Another thing I adore about Ms. Wells’ mysteries is that we get personal story with the detective work, and Dying Art is no exception. First, we are privy to Dylan being tempted by the memories of his gorgeous ex, Maddie. Oh, and is she a bit loony! I was on edge the entire book, wondering what, if anything, would happen between the two. Let’s just say I love the way Ms. Wells’ wrote the storyline, and am very satisfied with how it went down. We also continue to follow Dylan’s family life. One of the things I enjoyed immensely in the previous full-length story, Silent Witness, was the deeply touching look at postpartum depression through the eyes of both Dylan and his wife, Bev. I was a bit disappointed that we didn’t see more from Bev’s POV this time around. However, she was front and center, and one of my favorite scenes involved a discussion between Bev and Dylan at a dinner party hosted by Maddie. She provides a fantastic emotional edge to the thrill of murder. We also get more from Dylan’s pot-smoking, hippy mom, who has a few surprises of her own. This subplot was well executed, and I hope it continues into the next book! Without spoiling the story, I want to mention that there is a twist at the end involving Maddie’s family. I did not see it coming. The resulting revelations felt a bit coerced, but not contrived. I’m okay with what happened, and see the reasons for it, but I sure hope that’s the last we see of the Murphy family. 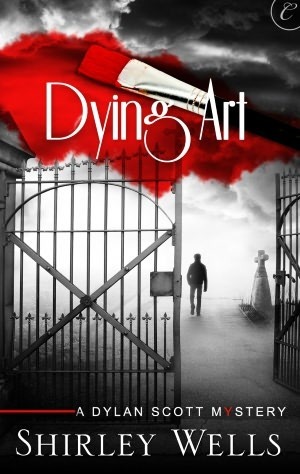 Dying Art is another great Dylan Scott Mystery. Ms. Wells has a way of immediately hooking me and keeping me invested until every rock has been turned, and the puzzle is solved. But it’s more than just a fantastic whodunit… the personal side of Dylan and his family add depth and warmth – just enough to enjoy Dylan, but never too much to turn the mystery into a drama. The multiple POV adds complexity and depth without confusion. You really should pick up Dylan Scott for a great reading escape!